Apple Mail is the built-in email client for Mac operating systems. Open the Windows Start menu, search for the Control Panel, and click on the icon for Mail. Click the Show Profiles button (note: if this is the first time you have setup your email you may not see this dialogue). Click the Add… button to create a new email account. Enter a Descriptive Name as your profile name and click OK. The Email Account fields should auto populate. Click Next to continue. A pop up will appear with your NetID@ad.uconn.edu. Replace that with your FirstName.LastName@uconn.edu. Enter Your NetID password, then check “Remember my credentials.” Click OK.
Click Add Email Account or + at bottom left of window. 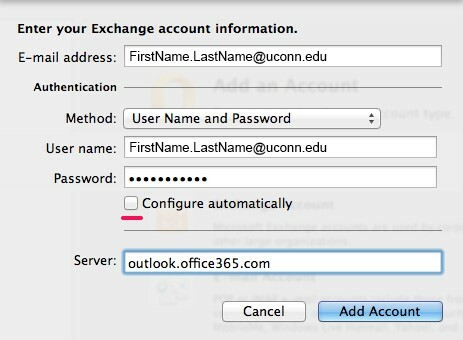 Enter your UConn Office 365 email address and click Continue. Enter your Office 365 password and click OK.
Click Done and Exit out of Accounts window. Uncheck the Configure automatically option and enter the appropriate information in the fields as shown in the screenshot below then click Add Account. Outlook account is added. Exit out of Accounts window. Open System Preferences and click on Internet Accounts. Select Mail and any other Apps you want to use with this account. Related Articles: How do I remove an email account from a desktop email client?